Princess & the Paper presented by A Jillian Vance Design: Jillian's Big Birthday Celebration Blog Hop Day 2! 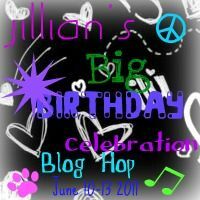 Jillian's Big Birthday Celebration Blog Hop Day 2! It's day 2 of my birthday blog hop, and we're counting down... 3 days until my Birthday! WOO! I'm very excited. So, lets get to today's projects, which are a lot. I have 4 tags to show you! These are the tags! 2 of each are the same design, but different color schemes. So... lets get started! This tag is more earthy/bright tones. its really really pretty :) I used my Nature Is God's Art stamp set, and Birthday Blessings from my 1st release, which you can order HERE and HERE. But here is the full recipe! Ok! Here is the second one with the same style! I basically used all the same things for this one, but this is a pastel looking tag. Perfect for a girl/woman's birthday, since it has the pink and purple tones. I love this style, its sooo cute! I love the background stamp which is sort of like the Swiss Dots Cuttlebug Folder. Its just so pretty. I love the look. This is basically the same, but earthy tones. And it looks wonderful. So, here's the recipe. I'm glad you all could stop by today! Here is the full list! Now, for the giveaway, a BIRTHDAY CAKES Cricut Cartridge! WOOT WOOT! Just enter my challenge below, and LIKE my facebook page! Your next stop is Bunny http://bunnyrunswithscissors.blogspot.com/! Jillian, you are on a roll with your tags. It is really a good use for your tree stamp! Be sure to check out my side of your hop! Pretty tags Jillian. Happy Birthday Week! Those a gorgeous! The colors are just breathtaking! I just love all of your tags! Great job! Love the tag. TFS I am a new follower. Those are so cool! I can't wait to order the tree set. Totally rocks! Beautiful job with these. I'd love to have some! TFS! P.S. Don't forget to stop by my blog tomorrow for something I made just for you. Will need your mailing address sweetie, so please email it to me. Love your tags Jillian! They are so pretty. Great job!! You ROCK!! These tags are fabulous!!! I love your stamps!!! !